I have been trying to "tone down" my texture processing because I truly enjoy vibrant colors. However, others are more attracted to the "softer" look and monochromatic feel. This image is beautiful in black and white, which I posted here on October 7th; but, the original color SOOC is gorgeous. This time, for Art of Texture (Kim Klassen's on-line course), I chose to use the scripted background and her choice of text. This is not for any particular challenge, just a wonderful image, in my opinion. More than likely, I will use it for gifting. What a gorgeous photograph, and the texture is lovely with this one. I love how you wrote the text on the leaf and the font that you used too. Your photograph certainly is abundant in beauty. I too love the vibrance of color, but I also love the monochromatic dreamy photos that is so popular right now. 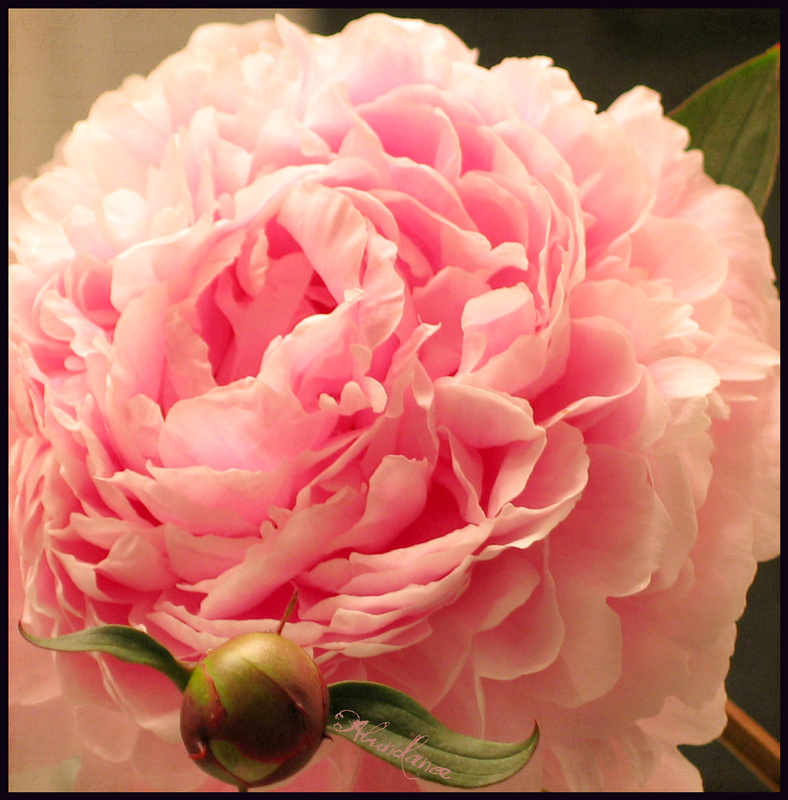 Given the choice between your sweet pink peony and a less colorful one, I'd choose pretty in pink. Thanks for stopping by The Cottage on the Corner and leaving a kind comment. This is gorgeous, Karen, amazing photo ! Love both your pictures of the Phoebe edition, but the picture Milena has chosen a bit more, the soft tones are so beautiful ! What a wonderful capture! I'm glad I came here to see this beauty! Thanks for your nice comment at my blog! working with Kim's textures can be addicting, can't they? your flower is beautiful... so full of life. Beautiful! I have just discovered your blog. I will be back. That is a beautiful flower - and picture. Hi Karen, thanks so much for your lovely comment back on TT, you are so encouraging to those of us who are just beginning and your blog and photos are so inspiring, urging us on to try new things. It is such a pleasure to meet you and visit and be refreshed by your beautiful images. Have a wonderful weekend and richest blessings for you and your family. I love everything about this one, Karen. Fantastic! Hard to imagine a delicate spring-like bloom when your winter is fast approaching. Love the juxtaposition of such a thought. Enjoy a memorable holiday week....with family and friends. I love to see the photos of your granddaughters......I am a bit shy sharing my grandchildren......but what could be more beautiful?